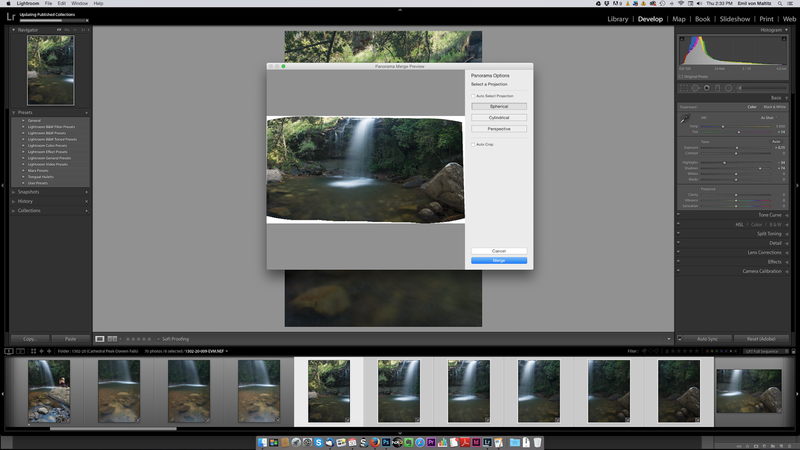 Lightroom CC/6 is a fairly significant update to the Adobe package. Several enhancements have been made, not least of which is the promise of faster operation thanks to Lightroom now taking advantage of some the newer, more powerful, graphics cards that available. In theory, if you have a new machine you should find performance in the Develop mode of Lightroom significantly improved, particularly for operations such as the healing brush, generating previews and dealing with filters and brushes. Theoretically, my iMac with it’s AMD Radeon HD 6970M OpenGL Engine passes the requirements for improved performance in Lightroom. I have been working on Lightroom CC for the last week and have to be honest that the improved speed is there, it’s just not as ‘significant’ as I had hoped it would be. Still, any improvement is good, but don’t expect the lightning like ingest and previews offered by Photo Mechanic and its use of embedded jpegs. In a nutshell though, Lightroom CC is faster than Lightroom 5, which is a good thing. In particular you’ll find that you won’t be tearing your hair out waiting for the healing brush to catch up with your clicks. 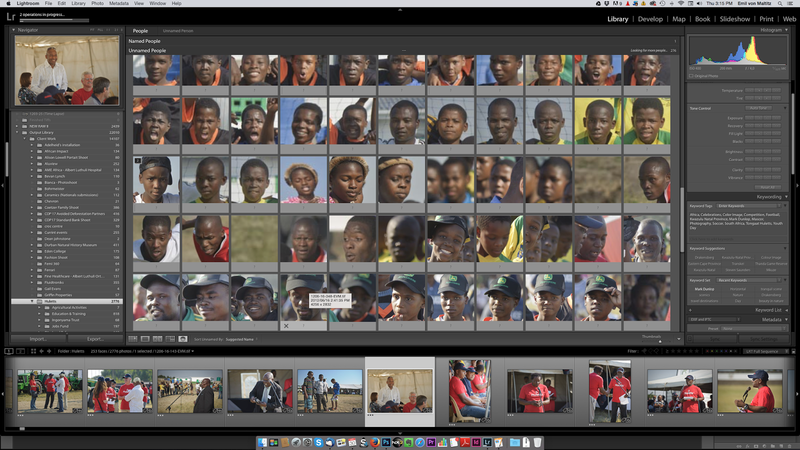 One of the biggest talking points has been the fact that Lightroom CC now includes the image merge feature. This means that you can merge a series of images to a panorama or merge them to a high dynamic range image. This basically puts even more of the Photoshop usage into the realm of Lightroom and makes it possible for quite a significant number of photographers to opt out of using Photoshop. Merging to panorama is even easier in Lightroom than in Photoshop, although it lacks some of the finesse. What I really liked is the way that it gives a preview of the perspective options before clicking for the panorama to be created. 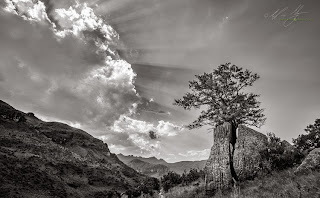 Then Lightroom merges the images into one big Digital Negative File (DNG) meaning that theoretically you have managed to hold on to the RAW information of the originals. What it does mean though is that you ultimately double up on the amount of data being stored on your computer. To me this isn’t really a problem as my panoramic workflow usually does this in any case. Some commentators have criticized this, wondering whether it would not be possible to create a virtual merged image, thereby allowing a halving of data storage requirements for the image. For me, it’s a useful feature, but I’ll probably still stick to PTGui for exacting work. HDR merge works in a very similar fashion, giving you previews to help with choosing the right settings. For basic subtle HDRs the new Lightroom feature is truly a welcome addition. Thankfully the merge to HDR avoids the complete over the top renderings that you can get from the likes of Photomatix and HDR Efex Pro. Another huge improvement is in the added brush feature to the filters dialogues. 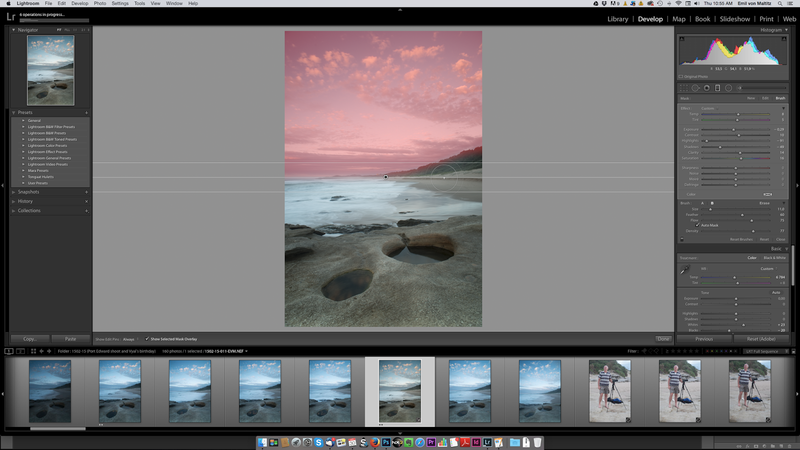 In the past you could either add a straight linear graduated filter or a radial filter (added in Lightroom 5). These were great, but not that useful if you needed to have something other a linear filter or wanted only a selection of a radial filter. Now you can add brush strokes to a radial or gradual filter, or more importantly, you can subtract from the radial or graduated filter. This is fantastic for graduated filters when you are wanting to erase portions of mountains or buildings from the graduated filter effect. This is another reason why many people may find Photoshop just that little less useful than it used to be. A feature I am still getting my head around is the new Faces feature. What this does is it searches through your folders and identifies faces within the photographs. You then have the option to tag those faces. It’s a keyword that is used, but it is kept separate from the rest of your keywords in a new metadata tag. This allows you switch the people keywords on or off when you export from Lightroom. At first I thought this was really a silly feature, but then I gave it a whirl on my database of Tongaat Huletts images. Wow, suddenly finding faces to keyword images is really simple. This is actually going to become part of my workflow now. It’s made all the more useful in the fact that once a face is recognized and tagged, Lightroom will continue to tag identified faces on new imports. The new People feature attempts to automatically recognize people in your images. You can then add a 'people' keyword which is automatically applied to future ingests if the same person is recognized by the software. If you use Lightroom to publish webpages, you might also like the new html5 galleries that are incorporated into the Web Module. Although there seems to be fewer default galleries, I personally find them more usable from client proofing point of view, as well as being more user-friendly from a developer point of view. Obviously I am being subjective on this count, but I have never really used the Web module to its full potential simply because I would rather use a dedicated application to build my webs galleries. I like the look of the new Lightroom galleries, so may review my workflow in future. One of the primary strengths of Lightroom has always been the management of files rather than the actual development of RAW images (several photographers I know will quickly point out that you can get better quality images from other RAW converters). Lightroom’s management is getting even easier now as small features are added. For instance, with the launch of Lightroom CC you can now add ingest images to a collection immediately. 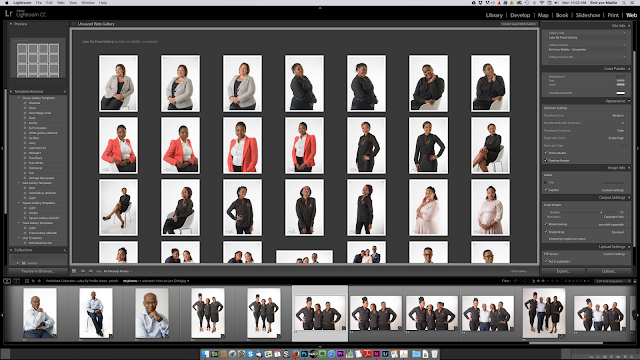 Already I have found this useful on ingesting images for a corporate shoot that I did last month. You can even have the ingest sync immediately with Lightroom Mobile. However, this is where I met the first serious stumbling block that Adobe have created for their users...and it’s a doozy. One big aspect that I hoped would be improved would be the integration with Lightroom Mobile. For those who are unfamiliar with this, it’s a partner app for the iPad and iPhone (and now also available for Android devices). Essentially it claims to offer the ability to sort, rank and do basic edits on images via your tablet. All changes are then conveyed back to the desktop version of Lightroom. A likely usage scenario would be to ingest images and sync them to Lightroom Mobile via a collection. You can leave the computer and work through the images, sorting and ranking on the tablet. This could be useful for the client, or the photographer. Think about direct ingest into Lightroom during a shoot, handing the iPad to the client and allowing them to go through the images, tagging the ones they want, while you pack up your gear. Alternatively, imagine being able to create a Mobile Collection that you can work on while traveling on a train, waiting to pick up your kids from school, or simply making up for lost time while waiting for a client meeting. Sadly the connection between Lightroom on your computer and Lightroom Mobile isn’t all that it’s promised to be to be. Adobe insists that the best way to connect devices together is via their cloud storage. This means that when you a create a collection in Lightroom and sync it, it first builds smart previews which are uploaded to the Creative Cloud storage space. From there Lightroom Mobile downloads these smart previews to work on your tablet. Once you click sync in Lightroom it seems to take an eternity to sync through to your iPad. Sadly, there is no way to create a local connection between your desktop Lightroom and your iPad Lightroom Mobile. So not only is the sync between gut-wrenchingly slow, it also eats up all your bandwidth. The good news with Lightroom Mobile is that once it is all uploaded then it’s relatively quick to do some basic edits on the tablet. These sync back to the desktop pretty quickly as well. The problem that I encountered has to do with colour and tone fidelity across devices. My iMac and Macbook Pro are colour calibrated. My iPad is not. The difference becomes glaring when you edit an image in Lightroom Mobile and then look at it on your calibrated monitor. Basically, forget about doing any accurate or critical work on your iPad since you will have to correct once back in Lightroom on the desktop. Finally there’s the fact that Adobe are doing their utmost to get everyone onto the subscription model. With the introduction of Lightroom 6 at US$149 (the CC Photography Plan with Lightroom CC and Photoshop CC is $9.99 per month), it’s all the more tempting for many people to shy away from the subscription model. Thanks to new pixel editors like Affinity’s Photo and Pixelmator it is now possible to leave the Adobe stable without any serious losses in usability and image quality. If you need Photoshop, and now with merge to HDR/Panorama in Lightroom this is becoming questionable, then the CC plan is actually more cost-effective than buying software and keeping it updated used to be. For me, using the full suite Adobe photo applications makes sense. For many it doesn’t. If you opt in for Lightroom 6 take a look at some of the other editors out there and compare whether subscribing is worth it or not. As for Lightroom 6/CC: It’s a worthwhile update in my opinion. If you use and like Lightroom, it’s a no-brainer.